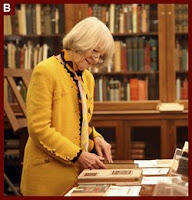 Judith Jones, senior editor at Alfred A. Knopf, edited the cookbooks of Julia Child, Marcella Hazan, and Madhur Jaffray, among others. She was a mentor and friend to Child, M.F.K. Fisher, and countless heads of garlic. She encouraged her authors to describe not only ingredients and technique, but also the texture, feel, smell and appearance of the dish as the recipe progresses, engaging us in the sensuous pleasure of cooking. I've just finished her avid and elegant memoir, "The Tenth Muse", which celebrates her passion for good food and honest cooking. For an interview with the Globe and Mail's Sara Hampson this past summer, Jones wore a vibrant turquoise linen suit and matching pashmina (shown in photo above). In another shot, I admired her ochre Chanel. At 85, she celebrates the "good taste" of both a fragrant poached salmon and a chic suit, and continues to offer both to the world. Here's a cookie recipe from the book, thin and crisp, like the author. Jones' dear friend James Beard called Schrafft's to coax the recipe from the president, then adapted the original recipe, which made over 200 cookies, for the home cook. Preheat oven to 375F. Line two baking sheets with parchment paper or a nonstick baking mat; set aside. In the bowl of an electric mixer, cream together butter and sugar. Beat in egg, dry milk, and vanilla. In a medium bowl, sift together flour, baking soda, and salt. With the mixer running, slowly add flour mixture to butter mixture. Fold in pecans. Drop heaping tablespoons of batter onto prepared baking sheets about 2 inches apart. Lightly flour your fingers and press each piece of batter into a 3-inch circle. Transfer to oven and bake until lightly browned, 8 to 10 minutes. Transfer cookies to a wire rack to cool completely. The 10th muse. I've never read that before but it makes perfect sense. Ah, another book to add to the reading list! Thanks for sharing this, Duchesse. This is going on my next book order and perhaps will do for a few Christmas gifts as well -- thanks! Brava, Judith Jones. Good to see appreciation for the editor's craft as well as the cook's. That ochre suit is beautiful. Not quite so fond of the matching turquoise jacket and pashmina. Duchesse, thanks for another great post. This will be a must read for me. I was lucky enough to visit James Beard at his home in NYC shortly before his death and since that time I have found myself reading cookbooks with the same intensity as novels. Jones' comment about the techniques and proceedures of cooking is echoed in Julia Child's books most definitely. I love her sense of colour! Now that my hair is grey/pewter I find I've moved away from the muted fall tones that I used to wear as a brunette. She inspires me to go even further with bold and bright tones for big items, not just accent pieces. Thanks for the tip - I will be buying that as a Christmas gift for my mother. And I think I may have to try the cookies also. Thank you for telling us about this book. I have now joined the "virtual queue" with the Toronto Public Library, waiting for this book. I look forward to perusing it soon. Maggie: I nsaw that too, and there's another gift idea for all my solo-living friends. She is also raising grass-fed beef on her Vermont farm. What a busy octagenarian!